Okay, so over a year ago we talked about getting our garage finished…organized…awesome. Little did I know that I was currently growing a mini bower bambino at that time. Fast forward through last year and Jeremy and I got to talking about the areas of the house that REALLY needed finished and what worked out well for us last year on the blog. Jeremy noted that we did a lot more videos in our garage space and we both agreed that it was a great income source and we both REALLY enjoyed being the ‘talent’ (I use that word very loosely) for brands and making our own videos (like the Crafting with Katie ones with my sister or the video we did with Ana & Jacob White!). Those videos are something we are both very proud of and we loved working with production crews and coming up with creative new ways to use products that we love. It was very kin to being a DIY teacher to the masses. I want to stress that I LOVE my job. I LOVE being a mom. I LOVE creating furniture and tweaking Goodwill finds and still not forfeiting my nursing schedule or puzzle time or eating all our meals with the kids around our kitchen table. I get to do my most important MOM job and still do my other BLOG job all in the comfort of my own home. I do not take that for granted. It is exactly what I want and I am so grateful that I get to do it all. Seriously. That might not be everyone’s dream but it is mine and dude, I thank God every day that I live it. Me – I am the one that is like “I like to create! I like to paint things with my eyes half shut so that I can feel the emotional value of creating! I want to cry while experiencing true color!”. I am sure Jeremy is rolling his eyes right now but it’s true….he is the ying to my yang….and he keeps me in check. So when we talked about getting back to the garage and cleaning it up a bit, Jeremy said that he thinks we should make it “Studio-worthy”. He said those words. That was basically him saying…let’s do this thing BIG. I was immediately on board. As far as storage, we will still be using our tall garage towers on either side of the windows since they were built to fit the space. They are great for storage tubs and so all the seasonal gear (camping, swimming, boating, etc) stuff will go there and be easily accessible for the few times in the year when we need it. 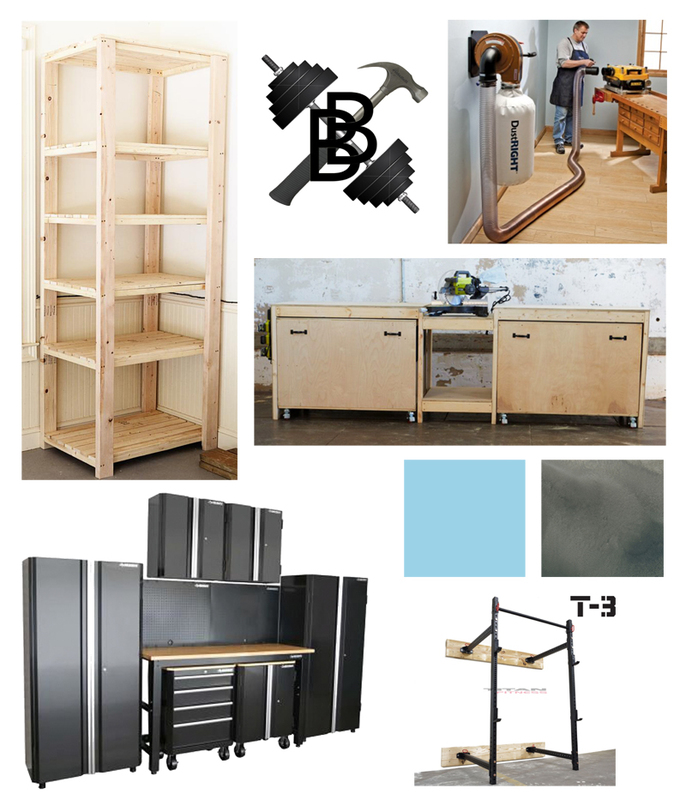 As far as furniture, we really need one giant work table on wheels. We need it to be storage inside for things like our tile saw, saw horses and random tools and then also be big enough for us to work on it. I am thinking something like Ana White’s workshop table that has removable pieces for storage. Maybe a different shape and maybe something that locks together somehow? Also, I haven’t told Jeremy this yet but I think we need sawdust management. I found this Rockler Dust Right Wall Mount Dust Collector. But if that doesn’t work into the plans, then I am sure we will figure out another option. LASTLY….and this is pretty exciting for my main squeeze….we are going to outfit one small area to be an at-home gym. Jeremy has been talking about doing some CrossFit stuff at home for a while and for Father’s Day, we want him to be able to work out right inside! That’s the goal! By June 19th, I want to have his new wall mount rack up and his weights to be accessible (while still safe from little fingers) and the best part is – this thing FOLDS to the wall so it can be a big space saver! I even think it would be fun to make him a sign. Any suggestions? Jer’s Gym? Bower Box? Are you a CrossFitter and just drooling over the possibilities?! In order to fit all the workshop/gym stuff, we also decided to keep all the gardening stuff in our basement storage area. Now that we have slowly paired down the stuff in storage, we can fit the lawn mower, the potting table and a bunch of lawn tools. We are also retiring some of the kid’s power wheels (they are broken and we have fixed them so many times that now it’s just becoming ridiculous. Don’t worry – they still have two!) so those will stay with the lawnmower. Some toys will still need to be in the garage so that’s gotta be tweaked! Yin yang, not ying yang 🙂 One of my pet peeves. Sounds like an exciting makeover! woot. can’t wait to see it come together. It’s so sweet to give him that man space I better he has really been craving! No way! You just taught me something new!!!! How exciting. Our garage needs a new make over as well. Since building our whole kitchen in there and all the splatters and spills, the floors need some love. I can’t wait to see how it turns out. That looks awesome! I’m having garage envy1 they’re not common in our area. Boo. Jeremy working out at home sounds sweet (my husband does), but what happened to the gym? And the house there? Just curious. How exciting! Love me a functional place. How about Jer’s WOD shop for a sign? We still are partners at the gym – but it just is hard because the WOD times are during his working hours (except for the SUPER early ones) and that would include a 15 minute drive each way. This is a much time-eating drive 🙂 And the house is still there – we get a new roof in the coming weeks! wahoo! Seriously! I have the same problem! I am so torn! What an awesome space you will have! So many functions and will look and feel so good. Hey! I thought it was ying and yang too. It sounds better to me!! My husband’s been wanting to redo our garage for sometime now, It’ll be interesting to see what you guys do for storage!!! Stupid question maybe – but where do the cars go? That makes all the sense in the world to me. I use commute time and its effect on family time to justify not working out, ever. Like I said, though, my husband works out from home- he’s not buying my excuses. Don’t you dare touch your gorgeous locks!